I love having the opportunity to feature companies here who are making a difference by caring about our environment. I've featured several forward-thinking companies who produce a host of essential household goods and now the time has come to show you the "green" way to shower! Rock Candy Life is a company out of Austin, Texas that has designed some beautiful selections of eco-friendly shower curtains. 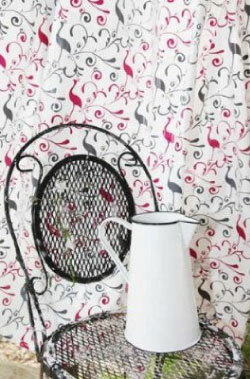 I recently had the opportunity to make my bathroom more environmentally friendly by reviewing their Whimsical Birds shower curtain. Keep reading to learn more! I reviewed the Whimsical Birds Eco-Friendly Shower Curtainfrom Rock Candy Life, which retails for $24.99, but is currently on sale for $19.99. I was also sent their new "Into the Woods" Shower Hooks, which retail for $14.99. 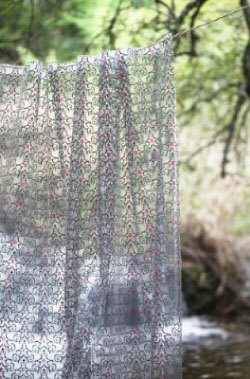 What exactly makes a "green" shower curtain? Well the first thing I noticed when opening the package of the Whimsical Birds shower curtain I was sent, was that there was absolutely no stinky, chemical smell. 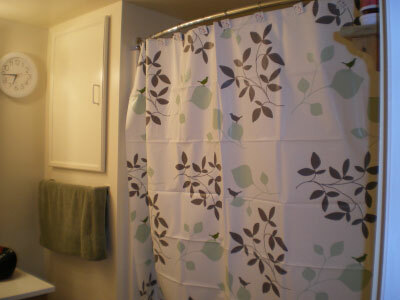 Most of the time, I am bombarded for several days by that nasty chemical smell coming from my shower curtain liner. Because the shower curtains offered by Rock Candy Life are PVC free, chlorine free and have absolutely no gas emissions, you can be sure that your shower won't smell like a toxic waste dump. Rock Candy Life's shower curtains are also 100% recyclable and 100% biodegradable, which means one less thing will spend eternity in our already overfilled waste dumps. You can also reduce further waste by using the Rock Candy Life shower curtain as both your decorative curtain AND your shower liner. It does double duty, which also saves you money. They currently have three beautiful designs (Whimsical Birds, Moroccan Luxe, Royal Luxe), sure to match a variety of bathroom colors and decors. If you would like to lessen your impact on the Earth's resources and maintain a beautiful bathroom at the same time, then you can't go wrong with the eco-friendly shower curtains from Rock Candy Life. This Mother's Day, give a thoughtful gift to both mothers...yours and Mother Nature with a wonderful Rock Candy Life shower curtain! What other ways can you make your home more eco-friendly? Disclosure: I received the Whimsical Birds Eco-Friendly Shower Curtain and Into the Woods Shower Hooks from Rock Candy Life in order to facilitate my review. No other compensation was received. This product review is based on my own personal experiences with this item and is completely honest and objective.